I had a craving for Brussels sprouts today, and since Alex is working late, I figured I might as well just have them for dinner. This was easy, quick, and I even cooked an egg on top at the end to make it a whole meal. I added some blue cheese, which you can skip, I might add some bacon next time if I had any. Cook the onion in the olive oil over medium-low heat until caramelized, 10-15 minutes, stirring occasionally. 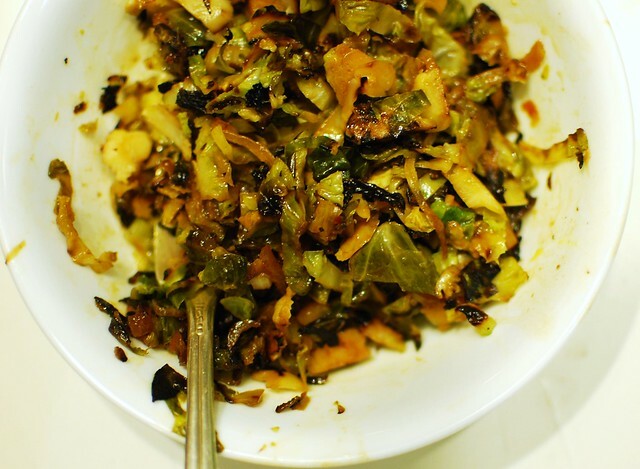 While the onions are cooking, cut the sprouts in half, and then cut them into thin strips. Add to the onions once they've caramelized, and increase the heat to medium-high. 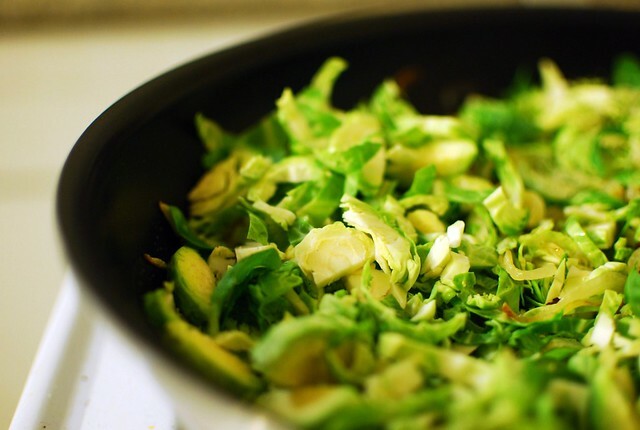 Cook until the Brussels sprouts start to brown, then add the hot sauce, salt, vinegar, and water and cover. Cook 6-8 minutes, until everything is cooked through. Sprinkle over the cheese, turn off the heat, and serve! Optional extra credit: crack and egg or two on top after you add the blue cheese, turn the heat on low, cover, and let cook about 5 minutes until the whites of the eggs are set. Yum! This sounds so much like something I'd make for myself if my husband wasn't around! Yum. Blue cheese is NOT gluten free!! The mold is the same as bread mold. PLEASE use feta or some other safe cheese!! Anonymous, if you don't want to use blue cheese, then by all means, don't. But there has been research done saying that blue cheese is SAFE, for example: http://www.glutenfreediet.ca/img/bluecheese.pdf as tested by the Canadian Celiac Society. I believe the research I have read and in fact many manufacturers of blue cheese, such as Rosenborg and Boar's Head state that their cheese is gluten free.